Over the past 30 years, the location where tropical cyclones reach their maximum intensity has been shifting toward the poles in both the northern and southern hemispheres at a rate of about 35 miles (1/2° of latitude) per decade, according to a May 2014 study published in the journal Nature. Tropical cyclones include tropical storms, hurricanes, and typhoons. "Historical intensity estimates can be very inconsistent over time, but the location where a tropical cyclone reaches its maximum intensity is a more reliable value and less likely to be influenced by data discrepancies or uncertainties," said NOAA/University of Wisconsin lead author Jim Kossin in a NOAA press release. The researchers used data only from 1982 - 2012, the era when accurate global satellite data makes a full study of tropical cyclone intensities most feasible. Figure 1. MODIS image of Hurricane Earl taken at 2 pm EDT September 1, 2010, by NASA's Aqua satellite. 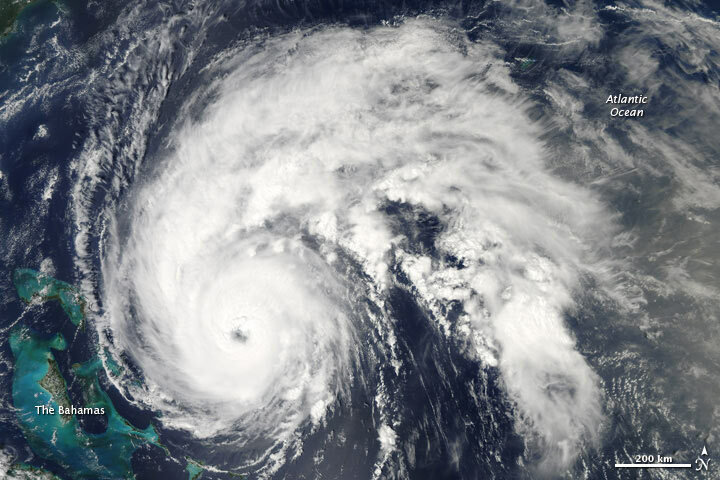 Earl's 140 mph Category 4 winds when it was off the coast of Northern Florida on September 2, 2010, made it the third strongest Atlantic hurricane on record so far north in U.S. coastal waters. Only Hurricane Esther of 1961 and Hurricane Connie of 1955 made it farther north in U.S. coastal waters at a higher strength. Both storms had winds 5 mph stronger than Earl--145 mph. One other Atlantic hurricane was stronger than Esther and Connie at a more northerly latitude--the second storm of 1922, which had winds of 150 mph. However, this hurricane was far out at sea, north of Bermuda. Image credit: NASA. The poleward shift in tropical cyclones was likely due to observed changes in vertical wind shear and tropical cyclone potential intensity over the past 30 years, which changed the regions most favorable for tropical cyclone development, the researchers said. Wind shear has been decreasing closer to the poles, and the potential intensity has been increasing (the potential intensity of a tropical cyclone depends upon the sea surface temperature underneath the storm and the amount of atmospheric instability, with warm air near the surface and cold air aloft giving higher instability and potential intensity.) Interestingly, these shifts were primarily observed in the Western North Pacific Ocean and the Southern Hemisphere's ocean areas. The North Atlantic Ocean and Eastern North Pacific exhibited only small poleward trends; the North Indian Ocean did not show any poleward trends. The researchers proposed that the poleward migration of tropical cyclones is linked to the observed poleward migration of the tropics over the past 30 years, since both have migrated similar distances. The causes of the expansion of the tropics are not certain, but a 2013 study led by Christopher Lucas of the Centre for Australian Weather and Climate Research/Bureau of Meteorology, The expanding tropics: a critical assessment of the observational and modeling studies, found that including increasing greenhouses gases, stratospheric ozone depletion, and pollution in the form of small particles were likely to blame, with no single factor by itself explaining the full expansion. As tropical cyclones move poleward, some regions closer to the Equator may experience reduced risk of damage, while coastal populations and infrastructure poleward of the tropics may experience increased risk. With their devastating winds and flooding, tropical cyclones can especially endanger coastal cities not adequately prepared for them. Additionally, regions in the tropics that depend on cyclones' rainfall to help replenish water resources may be at risk for lower water availability as the storms migrate away from them. Dr. Kossin used a similar data set in a 2013 paper, Trend Analysis with a New Global Record of Tropical Cyclone Intensity, to show that the strongest Atlantic hurricanes that reached a peak strength of at least 112 mph (Category 3) increased in strength by 18 mph (8 m/s) per decade between 1982 - 2009. Globally, the increase in strength of the strongest tropical cyclones was much smaller, about 2 mph (1 m/s) per decade. Dr. Kossin also published a 2008 paper in Geophysical Research Letters, "Is the North Atlantic hurricane season getting longer?" He concluded that yes, there is a "apparent tendency toward more common early- and late-season storms that correlates with warming Sea Surface Temperature but the uncertainty in these relationships is high". See my blog post on this paper here.